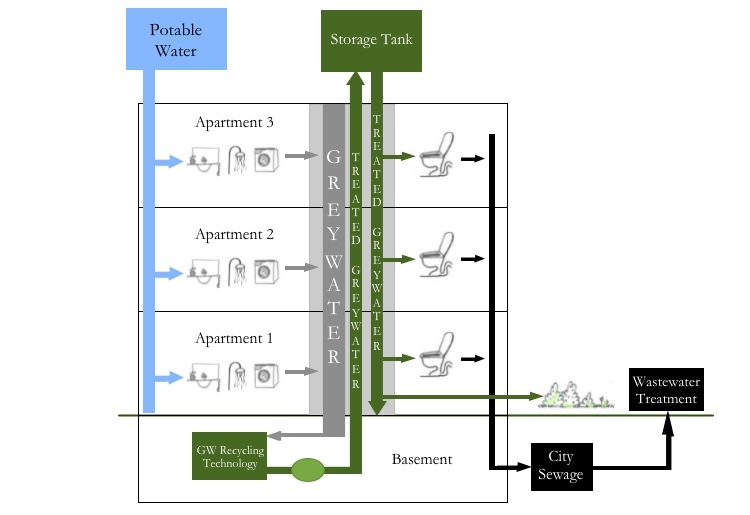 Home On Greywater What is Greywater Recycling? Recycling greywater is an effective way of conserving water. 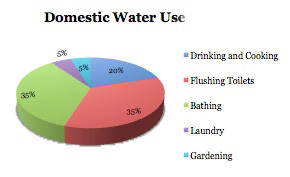 In industrialized countries, of the water consumed in homes, approximately 65% becomes greywater This segmentation of the water use is typical of water consumption patterns in developed countries. The consumption of bathing water is similar to that used for toilet flushing – 35% for each function. Thus, use of greywater to flush toilets can result in the conservation of approximately 35% of potable water with an additional savings of 5% of drinking water can be attained by using greywater to irrigate lawns. Currently, all the water consumed in facilities is potable water. This water is collected in one pipe and removed as sewage. In a greywater recycling system, two pipes would be used: one pipe would remove “blackwater” from toilets and “dark greywater” from kitchen sinks directly into the sewage system; the other pipe would remove the “light greywater”, such as bathing, laundry and bathroom sink water, and transfer it to a tank where it would be treated. The treated greywater would then be returned to the house for reuse to flush toilets (instead of the valuable potable water that is currently being used for this purpose) and for watering lawns.